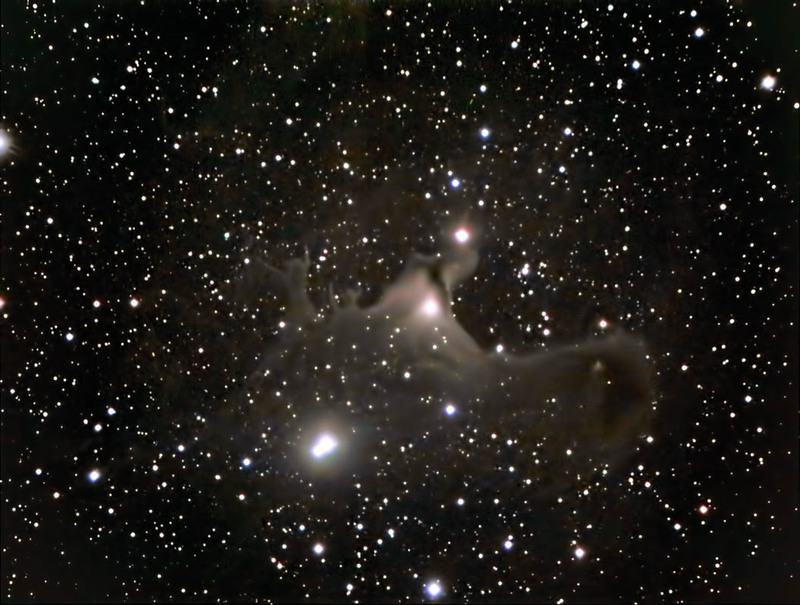 Sh2-136 (also designated as vdB 141) is commonly known as the Ghost Nebula. This is due to the ghoulish-appearing figures at the upper left of the nebula. It is approximately 1,200 light years away, at the edge of the Cepheus Flare molecular cloud; it is two light years in diameter. This is a Bok globule, named for Bart Bok, who suggested that these dark clouds are actually stellar nurseries containing protostars. They typically will produce double or multiple star systems. The protostars do not yet generate enough heat to be visible through the collapsing cloud of dust. Luminance Images were focused, acquired, reduced, aligned, and combined in CCDSoft. Color images were focused using the camera's live view. The subframes were calibrated, aligned, and combined in ImagesPlus.The luminance and color images were aligned in RegiStar and the composite image was created and adjusted in Photoshop.